Are Airstreams Worth the Price? Admittedly, as an Airstream owner, I’m biased on the topic. I love my Airstream. So, for me, It absolutely is worth what I paid for it. But I will tell you, in all honesty, that might not be true for you. Hopefully, I can help you figure out ahead of time if it’s the right purchase. The biggest reason I’d recommend an airstream is their durability. The aluminum body of an Airstream can last you a lifetime. While the wheels and trim and appliances may give way eventually, the body and frame, if cared for, are far more durable than the materials other trailers are made from. With other brands of trailers, leaks are inevitable before long. With an Airstream, they happen but are the exception rather than the rule. NoAnd no leaks means all the components inside the trailer are more likely to last. Mind you, you could buy 4 of the cheapest trailers for the price of one Airstream. Personally, I tend to prefer high quality, higher priced products. If you do too, then you will probably be happy with the Airstream as well. Frankly, Airstreams are not a good deal in this respect. Not only are Airstreams more expensive than most trailers, they are generally smaller. You won’t find slide outs, overhead bunks, or even much storage space. They are for folks who want to travel pretty light. They make good use of the space they have, but there isn’t all that much of it to go around. The smaller size of an airstream does have its advantages. They have a low profile and a streamlined shape. This makes them more stable to tow and lighter weight. It also lets them get under lower bridges and into tighter parking spaces. Even for other trailers their size, they are lightweight. This means you need a less powerful tow vehicle than with other trailers. That in itself can be a money saver that helps offset the cost. Airstreams are not entirely unique in design. There are other boutique trailers with similarly inspired design aesthetics. But most of those also come with Airstream level pricing. They are the only mass-manufactured trailer with an aluminum body and cool retro-future styling. 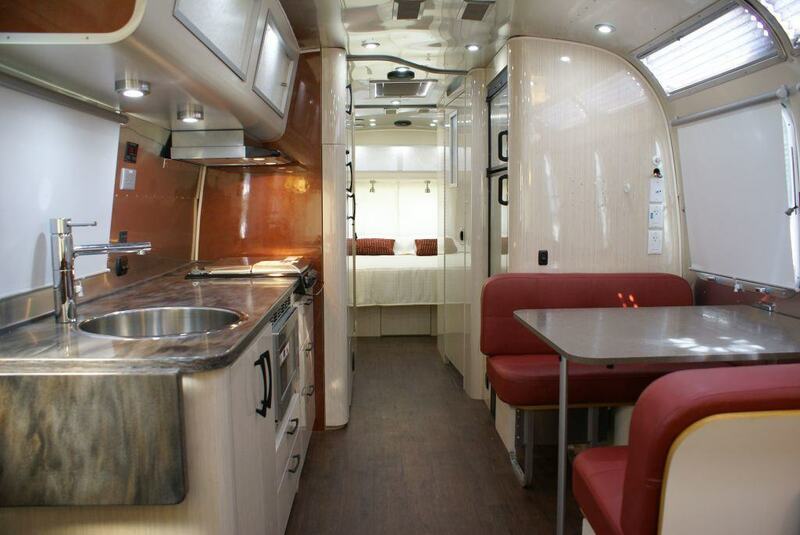 Furthermore, Airstreams often have interior decor that is more refined and upscale than other brands. Many trailers are designed to look like an ostentatious man-cave or a country kitchen. Airstreams are usually going for something more subtle and more sophisticated. For my wife, this was important, for me, not so much, but it is something I respect about the brand. Speaking of brand, that accounts for some of the steep price. 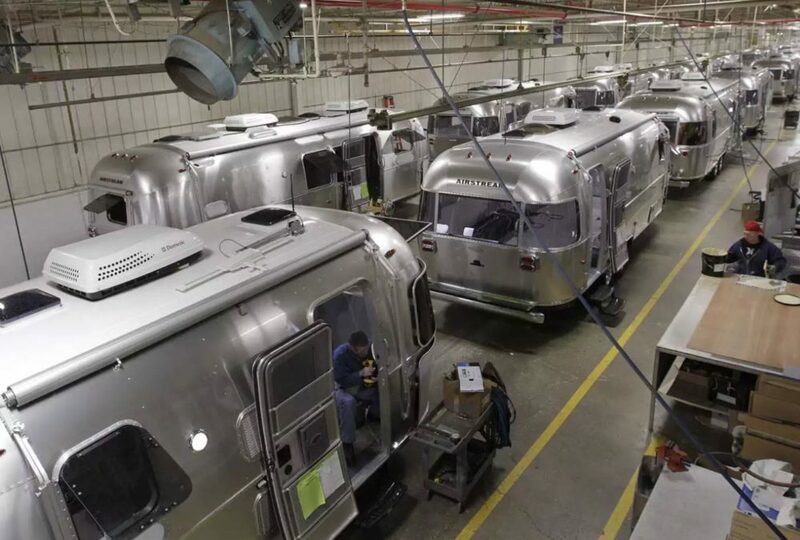 Airstream is an old company, an American company, and they have a long track record of making high-quality trailers. Airstream is also famous for its rabid fans. If you buy one, you pretty much get to be an instant part of the international Airstream family. It’s hard to put a price on that, but I can say it’s something unique that I really do like about owning one. 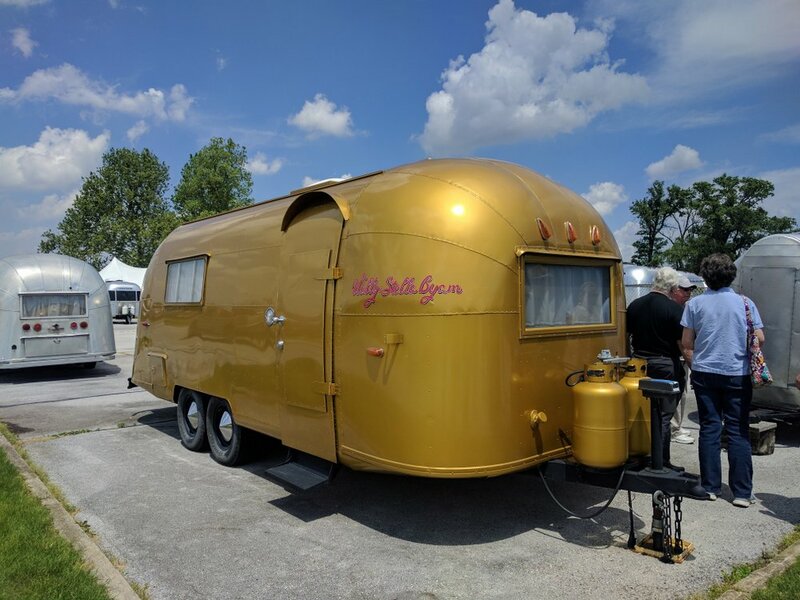 Stella’s Gold Airstream – built in the 1950s and still with us today. If you buy an Airstream, and take decent care of it, you can be pretty sure to get a good portion of what you paid back if you sell it. Airstreams hold their value better than any other brand. Mind you, losing 20% of the value of an Airstream may be enough to pay for a cheap trailer on its own, but as a percentage, you will be doing well. Like a car, if you buy a new Airstream, it quickly loses a portion of its value the moment you take it off the lot. Similarly, if you buy one used, you can save a pretty good chunk of money and sell it a year or two later for almost the same amount. If you are savvy, you could even make a profit. If you really want the best value, a used airstream in very good condition is hard to beat. Airstreams do come with pretty nice third-party equipment, but frankly, you could buy a cheaper Trailer and install the very top of the line range, fridge, and so on, and still pay less overall. I don’t think this is a factor for or against buying an Airstream. Airstreams being assembled piece by piece. It’s really the aluminum frame and skin that makes an Airstream rather expensive, and that is what makes them worth that expense. It is what makes it easy to tow, and what allows it to last a lifetime. It’s that durability that makes them so desirable on the used market. If you want the best, most reliable mass market trailer you can buy, then Airstream is worth the price. The more you plan to use it, the more it’s going to be worth the money. If you want the very best value proposition, then buy one that is gently used. You will save a chunk of change, and you can be sure you can sell it in the same condition for pretty close to the same price. Can you suggest a direction to begin hunt for used 30ft airstream? I would start with Airstreams Classifieds. They have quite a few postings and it is a competitive marketplace so you should get a good idea of the price range that a given year and model are selling for. They also have a nice community on their forums where you can ask questions of the regular buyers and sellers. Lots of folks there are very knowledgeable about vintage airstreams. I purchased one of the new 33′ Classic trailers a year ago. I love it .. generally… but I am very disappointed with the initial quality (from the factory) and service network…. it feels like the c.1975 American Automotive industry. They need a wakeup call – like Japanese manufacturers getting into the RV business. We have had the entire ‘Firefly’ system re-wired to make the A/C system work properly. The Hot Water system was also wired from the factory incorrectly. Airstream had issued a recall/service bulletin but nobody contacted us. We took it in before we found out about the recall, and it had to be re-wired to make the hot water tank work. Now, we need a new 12v converter. Several of the plastic clips that hold panels on were installed incorrectly and broke the first time we pulled the panel off. Shower door fell off the first time we used it. Our dealer service department never calls back and if you do reach them its weeks before they can give you an appointment. There is no ‘help desk’ where you can call with simple problems…. all of this is very disappointing. If I had known all of this I probably would not have bought an airstream despite how much I love it when everything is working, and how easy it is to tow (which is one of the best features). My experience is not unique. I have a friend that purchased a new airstream about 18 months ago and they have had to go back to the factory twice for serious issues, and the more I talk to people the more stories like this I hear. I think the quality thing that Airstream boasts about is a bit of a myth. Thanks for sharing your experience! I know you are not alone in that. We had quite a few issues with ours, though not as significant as the ones you experienced. We also had electrical issues. No doors falling off though, that’s pretty darned shoddy. The quality in the Airstream tends to be mostly about the materials rather than the assembly. I toured the main factory, and they are definitely not state of the art. As you say, it really is a throwback to the 1970s era of manufacturing. Most of the work is done by craftsmen. It’s good in that it all gets a personal touch, bad in that how good that personal touch is really depends on the person and how focused they are that day. Meanwhile, visiting a modern automotive plant, those are like a massive clockwork, they have craftsmen there, but everything they do has been planned out in advance and everything is double and triple checked at multiple stages. They are planning a new plant, not sure if they will join the 21st century in the process or not. Mind you, the consensus tends to be that nearly every trailer manufacturer is in about the same state of affairs, many far worse in terms of hiring good people and paying them well enough to stay focused. I met one couple who had visited many and said Airstream was on the upper end, but not the top of the line. Some of the Motorhome makers are, apparently, very modern in their manufacturing process. I’ve heard many dealers are pretty poor. The one we bought from was very responsive and helpful, but not always on the ball in getting things right. When we had to get our electrical worked on, we went to the headquarters where their work and support was really excellent for us. I’d say Oliver is a solid 2nd place in terms.of quality and build. However, they have nowhere the level of flexibility in choosing floor plans. That alone has held me back. Airstream definitely has the edge in terms of a variety of sizes and floor plan diversity. I understand this holding a buyer back in terms of the more limited Oliver sizes and floor plans. We like the more petite width of the Oliver, the double-hull 4 season design, and the top-shelf quality and build as well as the “look”. Despite our preference for the Oliver, we still love Airstream eye candy! They are gorgeous. Just beginning to consider an Airstream and am on the steep part of the learning curve. The aesthetics, focus on quality and function really appeal. Hope the build quality, should/when we buy one, lives up to the reputation. Thanks for your post and this blog, and happy and safe travels! You are very welcome Stretch. As a heads up, everyone I’ve ever spoken to has had some kind of issue with a brand new trailer for every brand out there., including Airstreams. We were forewarned and spent our first couple weeks near the dealer so we could get things patched up as needed. The trailer industry hasn’t achieved the level of quality control the auto industry has. Once we got past that initial breaking in period, our Airstream has been very solid for us. I’d guess that the smaller a trailer is, the less of these it ends up having, just due to having fewer components and less opportunity for someone to make a mistake in assembly. Our experiences doing warranty work were always good. We never had to pay out of pocket for any of the issues we encountered.